Dressing, sauce, dip, whatever you want to call it……It’s delicious! 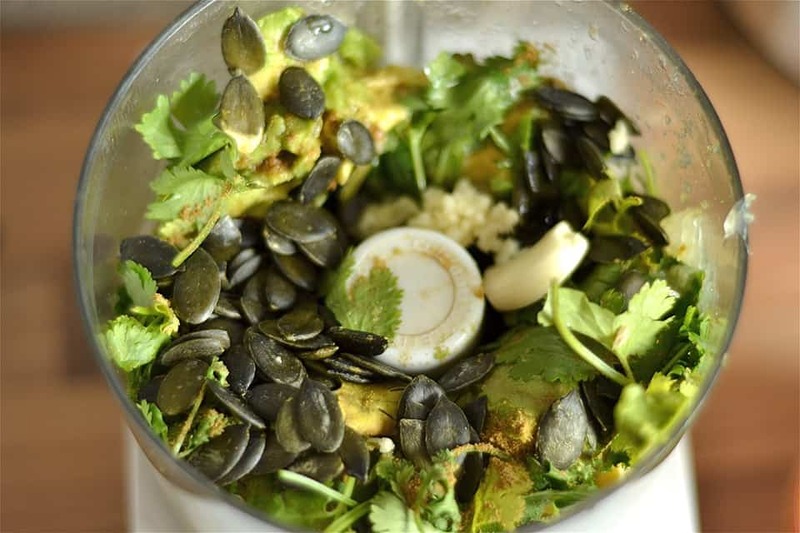 This creamy avocado concoction contains all the good green things in life: avocado, pepitas (pumpkin seeds), limes, and cilantro. I suppose you could throw in a jalapeño for some heat; I’ll have to try that next time. As a kid, my favorite Mexican chain restaurant was El Torito. I have not been in years, like probably at least 15 years. But I give credit to El Torito for being the restaurant that introduced me to salad. They had what the called a “Mexican Cesar Salad”. 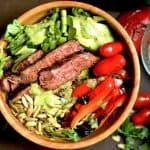 It had this yummy green dressing tossed with romaine, cojita cheese, tomatoes, tortilla strips, and pepitas. I used to order this and nothing else, often getting seconds or thirds! Just for fun, I looked it up online and they still feature it on their menu. So flash forward many many years. I still think about that dressing. ALOT. 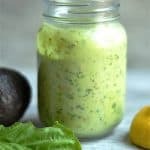 I have also been eyeballing my avocados and dreaming of a way to create this dressing by adding avocado. So here it is my friends; a recreation of my one of my childhood favorites. I am pretty sure their version does not contain avocado, but instead uses some other base to make it creamy. 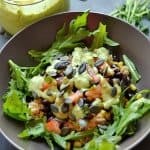 The avocado is going to be make this dressing much healthier and also friendly to my Vegan and Paleo friends. Lots of monounsaturated healthy fats in this one. 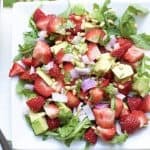 Throw this together with some greens, tomatoes, pepitas, black beans, and tortilla strips for a simple and sophisticated salad to any Mexican themed dinner. I like it as a dip, as a dressing, as a sauce on my mexican food, ummm maybe I’ll even try it on my chocolate. But seriously, try it out. My kids did love this dipped with some cucumbers. I just love all the shades of green. This will take you a whopping 3-4 minutes to make. Definitely the best 3-4 minutes of your day that you’ll spend today! 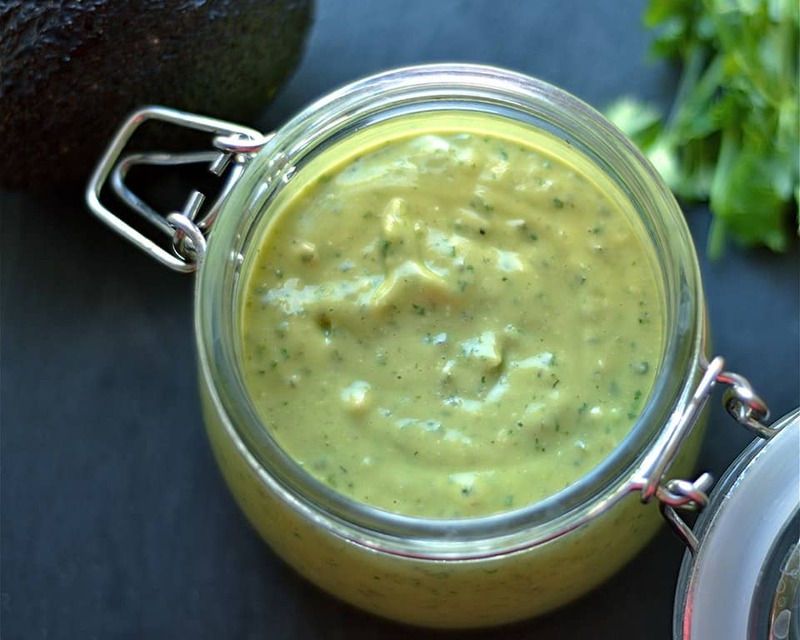 Just be aware, that after a day the avocado starts to change the shade of this dressing to a brownish color. It will probably only be good for 2 days in the fridge. I don’t think it will really matter though, this will definitely disappear quickly!! Place all ingredients into a food processor or blender, and pulse until smooth (about 30 seconds). 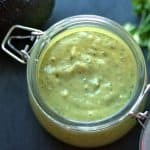 This dressing will be thick and can be used as a dip. Add more water for a runnier consistency (another 1/4- 1/2 cup). This dressing will only keep fresh for about 2 days in the fridge. Thank you for this recipe! My husband and I are eating whole thirty and I have been struggling without dips and dressing. This is delicious! I made sure to lick the blender clean so none of it was wasted, I could probably eat Paleo with this kind of yumminess! I would use red wine vinegar or plain white. The balsamic vinegar will have a strong taste! I made this tonight and my friends and I loved it! We put it on our salads and I also used it to dip my grilled chicken in. Everyone kept reaching for more! So easy to make right in my mini chopper/blender. (I didn’t have any cumin and my friends don’t like cilantro so I didn’t add those but still loved it).